Hello and welcome to the 642nd installment of the SWD. Vehicle-borne improvised explosive device killed a civilian in the city of Azaz in northern Aleppo. Al-Bagouz axis: In the morning, our fighters carried out a large comb campaign in the areas they liberated, and clashes broke out against the remnants of the terrorists, in which a number of terrorists were killed. During the combing, our fighters seized a number of weapons, a motorcycle and a number of rockets. The terrorists attacked our forces on the other side of this axis, using all kinds of heavy and light weapons. Our fighters confronted them and killed a number of terrorists, while the others fled. As a result, our fighters launched the second attack on the terrorists’ positions, advanced in this axis and managed to establish a number of new points after killing a number of terrorists and seizing a number of weapons. In the evening, our fighters launched another attack, advancing a distance of 1 km, and they were able to install other 8 points. The terrorists attempted to launch a counter-attack, but our fighters confronted them and thwarted the attack. Moreover, the Global Coalition’s aircrafts launched several raids targeting the mercenaries’ positions and its artillery destroyed their fortifications. In another side of this axis, in the early evening hours, our fighters launched a broad attack on the terrorists’ points, and they were able to install 4 new points and control one of the villages in the area. Immediately, the military engineering teams began dismantling the planted mines in the village heavily. On the other side of this axis, our fighters launched an attack on the terrorists’ positions after intensive movements. Violent clashes broke out, in which a large number of terrorists were killed and some of their bodies were kept at the hands of our fighters, while some terrorist elements attempted to launch another attack using booby-trapped cars, but our fighters confronted them, blew up a number of the booby-trapped vehicles and seized one of them. The terrorist organization tried to repeat the attack twice, but all its attempts failed, and a number of terrorists were killed and subsequently, our fighters advanced on this axis and established a number of new points. At seven in the morning, our fighters launched a new attack on the terrorists’ positions. Violent clashes broke out and lasted until noon. The terrorists used all types of weapons and mortars. Dozens of terrorists were killed and wounded in the clashes amid the terrorist organization’s attempt to attack with two car bombs, but they were destroyed before reaching the points of our fighters. In the afternoon, the terrorists launched another attack with other two car bombs which were targeted and destroyed from afar before reaching their targets. 2 – Hajin axis: Violent clashes broke out between our fighters and the terrorist elements in this axis while the military engineering units of our forces were combing the mines planted by the terrorist organization. The terrorists used in the clashes all types of light and heavy weapons, and that resulted in killing a number of terrorists. On the other side of this axis, during the combing operations, our forces confronted a group of terrorists and killed several of them, while our fighters found a number of trenches and medical equipment. 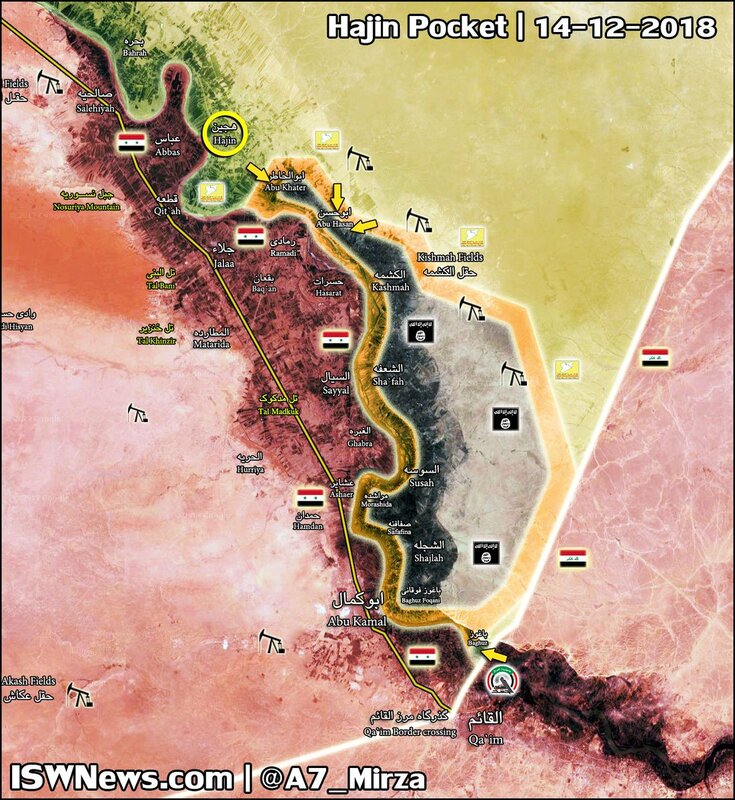 In the evening, our fighters launched a massive attack on the fortifications of the terrorists, killing and injuring dozens of them, and advancing in the area where the clashes took place and they were able to install 14 new points in conjunction with the launching of a number of air raids on their positions. Our fighters also seized a number of weapons. -The number of terrorists killed: 96 terrorists. – The weapons and equipment seized by our fighters: Quantity of medical instruments, (SPG) weapon number / 1 /, motorcycle number / 1 /, rockets number / 11 /, car bomb number / 1 /, Dushka weapon caliber (12.5) / 1 /, (PKC) weapon number / 7 /. – The terrorists’ losses: The destruction of 28 terrorist sites, destruction of 6 car bombs, destruction of 2 weapons storehouses, destruction of 2 trapped devices factory, destruction of a vehicle for the transfer of ammunition, cutting off 8 military roads that used to by used by the terrorists. – The number of strikes by the International Coalition: 66 strikes. Unknown gunmen reportedly killed one and wounded seven elements of the Syrian Democratic Forces at a checkpoint in the village of Al-Jaradi in eastern Deir al-Zour. Afghan National Security Forces reportedly killed 18 and wounded eight elements of the Islamic Emirate of Afghanistan, as well as destroyed a vehicle in Khwaja Sahib Posh and Dawlat Abad districts, according to the Afghan Ministry of Defense. Four elements of the Afghan Local Police surrendered to the Islamic Emirate of Afghanistan in Aqmas and Sowr areas of Qaysar district. Afghan National Security Forces wounded five elements of the Islamic Emirate of Afghanistan in Kohistan district. Islamic Emirate of Afghanistan wounded two elements of the Afghan Local Police in Kohistan district. Islamic Emirate of Afghanistan’s improvised explosive device killed two and wounded two elements of the Islamic Emirate of Afghanistan in Rodat district. Residents of Gul Khanj area in Chahar Sada district pledged their allegiance to the Islamic Emirate of Afghanistan. The aforementioned area consists of more than 70 families, under the leadership of Mawlavi Ghulan Sarwer and commander Yasin. Islamic Emirate of Afghanistan ambushed an Afghan National Police’s foot patrol, killing two policemen in the city of Ghazni. Afghan National Security Forces killed four and wounded two elements of the Islamic Emirate of Afghanistan in Tarinkot district. Afghan National Security Forces killed five elements of the Islamic Emirate of Afghanistan and destroyed two motorcycles in Marjah and Nahri Saraj district. Islamic Emirate of Afghanistan’s snipers killed two elements of the Afghan National Security Forces in Nad Ali and Marjah districts. Afghan National Security Forces reportedly killed 34 elements of the Islamic Emirate of Afghanistan in Maywand district, according to the Afghan Ministry of Defense.